starts tomorrow. Hmmmm. I don't really have a lot to say about it this time. I get excited about ideas ... and then things happen and I don't get to use them. That gets expensive! Like I love all of Smart Chick's STEM challenges but have yet to get to use the set I have. Would be silly to get more. But wouldn't it be fun? The Minecraft set? And picture book monsters under bridges? And mythology? And the winter games ones? Or just more of the just "regular" ones? 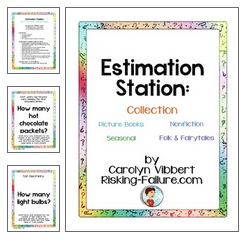 I do want to get Carolyn's Estimation Stations. They look fun and anything math I can promote that I actually understand (had a teacher ask me to do something on volume ... and I had to say no :( cause I read a blog post about a volume activity with Duplos and flipped out at all the vocab) is a WIN. I gush on too much about clip art. I knew I had a problem when I realized I forgot to ever put out my own Valentine's signs. I love to make them but then got behind and I didn't remember to get them out! My new favorite artist is Kari Bolt, though I still love Creative Clips and Melonheadz and Digital Bake Shop and Pink Cat Studios. Is there anything you are thinking about getting?